A self-described homeless man handed Easton Syme, a senior DoF official, a threatening note as he was getting off the Washington Metro on Monday. 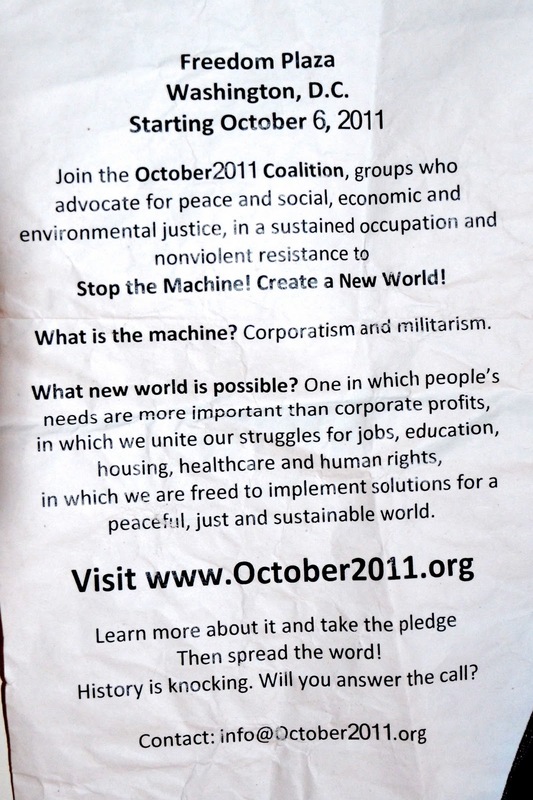 According to the typewritten note, a group called October2011 Coalition is planning a "peaceful" occupation of the nation's capital from 6 October. Similar to the Occupy Wall Street movement, October2011 Coalition draws inspiration from the Middle East. In fact, the Coalition embraces the same tactics Middle Easterners used to topple governments -- leaders friendly to the United States and its ally in the region. Al Qaeda takes credit for the revolutions. What is the machine? Corporatism and militarism. The note makes us cringe. Corporatism and militarism is our bread and butter. Evidently the group hates the US Department of Fear and our corporate partners. Sadly, there are some crazy, hate-filled people in America. Upon being made aware of the October2011 Coalition note, Malcolm P. Stag III, Secretary of Fear, called an emergency meeting on Homeland Security. At the meeting scheduled for Wednesday afternoon, high government officials will meet with corporate lobbyists to discuss possible avenues for funding new security initiatives. Anyone with any information about October2011 Coalition is asked to leave a comment on this blog or contact the department on Twitter (@FearDept).